Limiting taken to the Max... or to a T.
It seems that there's no limit to LVC-Audio's limiter plugin ambitions, as it's just announced two of them. 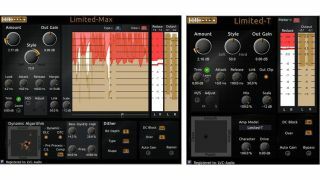 First up is Limited-Max, a mastering limiter that offers the likes of dithering controls, mid/side processing, k-metering options, and inter-sample peak metering. It's said that it dynamically switches between three different processes to achieve a more transparent sound, while controls in the Dynamic Algorithm section can be adjusted via an X/Y pad. Secondly, there's Limited-T, which is designed for buss limiting. LVC-Audio admits that, in some respects, this is a slimmed down version of Limited-Max, but it adds some 'vintage' style features for adding glue to both busses and individual tracks. It features five selectable amp models, and simulates the characteristics of certain analogue limiters and compressors. Both plugins are available now for PC and Mac in VST, AU, RTAS and AAX formats. Limited-Max costs $64.95, while Vintage-T is $29.95. However, you can currently buy both together for $70. Find out more on the LVC-Audio website.